Confession time: Even though I make my living writing about fashion and beauty, I've always bought my makeup at the drugstore (save for the occasional lipstick). I've also never really enjoyed wearing makeup. But now that the weather has a taken a turn for the worse, so has my skin, and my $7 BB cream from Duane Reade has not been cutting it. So after years and years of being a beauty cheapskate, I finally went to... Sephora. It was a life-changing experience. I went in simply hoping to find a good foundation, but I left a changed woman — a makeup fanatic. I now feel evangelical about it, and I urge you so strongly, those of you hesitant to invest, to convert to the way of high end makeup. It will change your life. 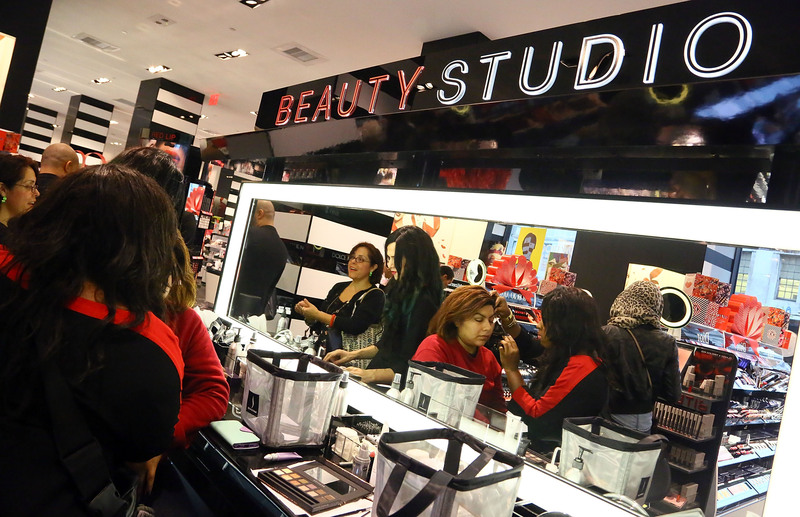 It's not an easy transition: Real makeup is a different game than drug store goop. So in case you're overwhelmed, or don't understand how $40 foundation could possibly be worth it, I'm sharing the lessons I learned to help show you the path of righteous makeup. A big reason that I've avoided stores like Sephora in the past is that for a makeup novice like myself, they're intimidating. So no, I didn't just waltz into the store expecting that I'd figure out how to navigate the billions of brands they offer. Instead, I spent a good amount of time on Sephora.com first, reading product descriptions and hundreds of reviews. Although this didn't help me decide exactly what I wanted to buy, it did give me a sense for what I should be looking for and what different brands offer. I almost put on makeup before I went, but then I remembered I was trying to find a foundation, so I decided to go with a clean palette (even though my skin looked horrible and the women working there probably thought I looked like a hag). I didn't regret this decision because I got a very intimate sense of how all the different foundations looked and felt on my skin. I just rubbed a bit of each on my chin (which was conveniently a little broken out, so I could see how it covered) and checked out the coloring in Sephora's well-lit mirrors. Then I wiped it off and tried another. Until I found "the one." I'm independent, so I didn't take up Sephora on its offer to help me find the perfect shade of foundation. If you like interacting with people, though, you totally should. Otherwise, try as many shades as you can. Part of what makes Sephora so much better than a drug store is that you can test all the products and all the shades. My skin is a weird combination of pale, yellow, and pink, and there were many shades at Sephora that I though would be perfect, but ended up looking dead wrong. Eventually, though, I found one that somehow matched my face's weird color. Primer is one of those things that I've always thought is a sham. But my friend Sam Escobar (who does the best makeup tutorials on The Gloss) has always sung the praises of Smashbox primer to me, and since she's not crazy, I took her word for it. I got the green one (that reduces redness), and not only did it make my skin look way better, it also feels like liquid silk. Putting it on makes me feel like a princess. A princess with less splotchy skin. There is a price range at Sephora, but if you've been spending tuppence on your makeup, you're going to have sticker shock. Remember, though, how long it will last you. Also remember that of all the things you wear, makeup is the thing physically closest to you. It should be the thing you splurge on. You only get one skin, and you should treat it well — just like you might spend a little extra to get a kale salad instead of a Big Mac for lunch. So go now! Get thee to a Sephora! And let me know what amazing things you find.